Whatever color flower arrangement you are after, we have every possible color combination in unique floral design styles to ensure that you will find the perfect bouquet for you. We know that everyone has a favorite color coordinated floral bouquet and we have ensured that we have a huge selection to meet our customer's wishes. 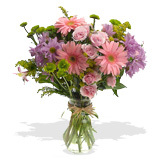 Hand-tied floral bouquets, or contemporary floral bouquets we have a great selection, and we guarantee you will not be disappointed.